Our dentist surgery in South West London, dedicated to providing high-quality care to its patients, is based in the heart of Southfields, but what do you know about this area? Situated about six miles from Central London it sits between Putney and Wandsworth to the North, Wimbledon to the South, Earlsfield to the east and Roehampton to the west, however, there is much more to the location than just these facts. We take you through the history of the location, and everything else you need to know about this part of the borough of Wandsworth. In terms of how it got its name, Southfields original from the old manorial system, where it was previously known as the South Field of the manor of Dunsford. Located in inner London, the area of Southfields only started being developed when the District & London & South Western Railway from Wimbledon to Putney Bridge opened in 1989. Prior to this point, the location remained mostly as fields, with very few inhabitants. In fact, a number of the former pathways through the fields in the area are now a part of the road route system. When the railway opened in June of 1989, this is when the area started to become more urbanised, having a huge impact on the location, with the first school set up just a year after the introduction of the railway, and just two decades later, much of the area was covered in houses. The Frame Food factory in Southfields, built in 1904. The light industry was particularly important for the development of Southfields, and the impact can still be seen in this part today. 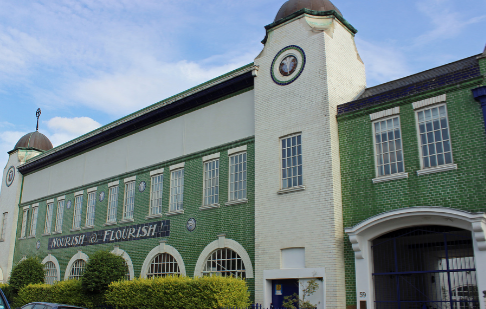 For example, the distinctive-looking Frame Food factory, with its green ceramic tiles, on Standen Road built in 1904, as well as the eye-catching OK Sauce factory that was set up in 1924. Across the area, there are a number of Victorian and Edwardian style terraces, as well as larger detached and semi-detached 1930s and 1950s house, partly as a result of a significant increase in demand for housing in London after the Second World War. This lead to the construction of housing schemes on Beaumont Road. Southfields also become the very first area in London to have a mosque. Built by the Ahmadiyya Muslim Community in 1926, the Fazl Mosque now serves as the international headquarters. These days, many of the bigger houses have now become flats, with the location now completely residential and a far cry from being a plain of open fields. The main residential area of Southfields is commonly known as The Grid and is a hub of lively restaurants, bars and houses. According to the last 2001 census, there is a population of approximately 14,000 in the area, but in terms of historically significant famous old residents of the area, no less than the famous novelist and poet used to live in Southfields. She lived here way back in 1859 on Wimbledon Park Road with her lover George Lewes whilst writing The Mill On The Floss. Other previous residents include the comedian Paul Merton, and even civil human rights activist Eleanor Roosevelt ( responsible for the adoption of the Universal Declaration of Human Rights), who attended Allenswood Academy from 1899 until 1902. Located just a ten-minute walk from Southfields Underground station, most people recognise the location as where Wimbledon is held in the summer each year. Of course, one of the most famous things that Southfields is famous for, and what most people know about it, is the fact that it is home to the main London Underground Station for the Wimbledon Tennis Championship, with over 39,000 spectators coming to the grounds at any one time, and over 470,000 people attending in 2018 alone across the two weeks the tournament was on. Each year the tube station is decorated every summer whilst Wimbledon takes place. 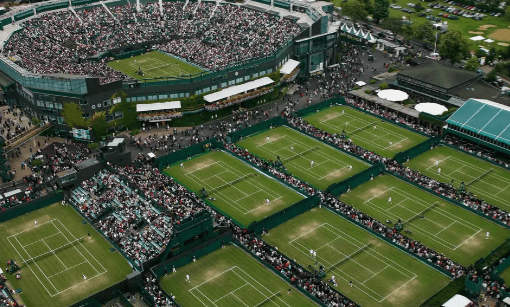 In the past, this has included making the platforms resemble grass courts to mirror the tennis courts of the championships. Take a look at the video below to see more about how this looked in real-life. Our dental practice, founded by Dr Morris Weinstein and based in Southfields and Wimbledon has played an integral role in ensuring high-quality dental care in the region for over 30 years, serving the community covering the breadth of the South West London area. Our services are wide-ranging, providing our patients with routine check-ups. to cosmetic treatments such as tooth whitening and Invisalign. If you want to book an appointment with us or find out more about the services that we provide, we are easily located in Southfields. Preventive Dental is simply a 3-minute walk from Southfields Underground Station, under 10 minutes from the All England Tennis Club situated in Wimbledon Park. With a number of different parking locations available in The Grid of Southfields. PreviousPrevious post:How to get your children to brush their teethNextNext post:How often should you go to the dentist?